Like scary cupcake designs? 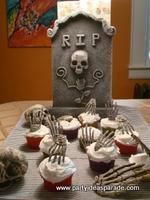 Try these cemetery Halloween cupcake ideas for your next costume party. They are easy to make and if I had to tell you what I paid for the accessories I used...I would tell you they were cheap. Those great looking hands were only 3.00 and the tabletop cemetery headstones and skulls...plus a fence and hands they came with, were only 10.00. I do have to tell you I bought the tabletop cemetery kit on sale. It was originally 29.00. It is pretty big, about 15" high and it came with three tombstones. Now on to the cupcakes. You can see how easy they were to make. I just frosted cupcakes and put those scary, bony hands on top. They really look great! You can find scary cupcake toppers for Halloween at our Hallween cupcake page. Just take that link and go all the way down to the bottom of the page. Or find them at Find some Halloween Cupcake Rings. Hope you like my scary Halloween cupcake picture!